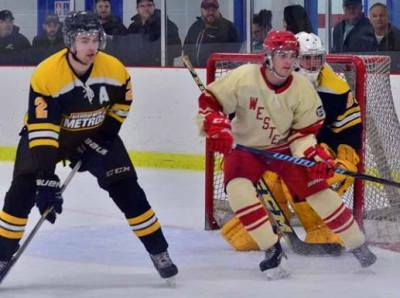 For the first time ever, the Arsenault's Fish Mart Western Red Wings and Sherwood Metros will meet in the best-of-seven Island Championship series with game one scheduled for Sunday night at 7:30 in Evangeline. The defending champion Red Wings started the season off at the bottom of the standings with only two wins in their first nine games but responded with 15-straight wins and have been the team to beat ever since. Jason Gallant lead the team and league with 69 points and Bronson Banks was the busiest goalie in the league by far with over 1500 minutes played. In the first round, the league parity was demonstrated when the Red Wings had all they could handle in a close 5-game series against the Eastern Maniacs. When the Red Wings had a slow start to the season it was the Sherwood Metros that lead the league in the standings in the early going before leveling out and capturing second place in the regular season. Tanner Lund lead the team offensively with 66 points and Alex Kelly was second among the league in save percentage with a solid .903. It looked for a while like it would be another Kensington/Western final after the Vipers took a 3-1 series lead in the opening round, but the Metros stormed back with three straight wins including a 4-0 win in game seven to eliminate Kensington and keep them from the IJHL final series for the first time since 2002. The Red Wings had the edge in the season series (5-3), but this has the makings of another long championship series. The series will shift to Cody Banks Arena for game two on Tuesday night at 7:30. The winner of the IJHL Championship will go on to represent PEI at the 2018 Don Johnson Cup April 24th - 29th in Sydney, NS.